We Take an Overnight Trip | Sprezzatura, Y'all! One of the things we really wanted to do when we made this leap was to travel around Italy and other parts of Europe. We thought the time was right to test the waters and take a little overnight trip. We decided to go to Verona, mainly because we’ve never been there and it looked like a pretty easy drive. It wasn’t. It’s about 3 hours away and it’s pretty much all autostrada from here. Sounds easy, huh? Lessons we learned on this trip: avoid the autostrada around Bologna, especially going west; 3 hours on the autostrada is not a good idea in the car with no AC (it wasn’t too hot, but way too loud); and be doubtful of the directions off Italian hotel websites. 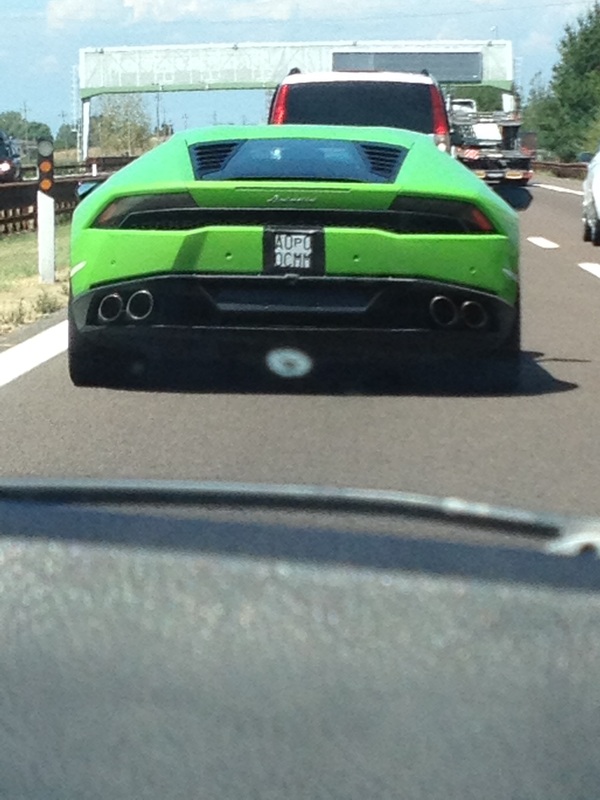 On the autostrada to Verona, we were passed by a Ferrari, a Maserati, and what we think was a Lamborghini. I can’t say that we’ve ever been passed by such an impressive array of machinery before. Our middle grandson would have loved it. We took a picture of the Lamborghini, only because he got hung up after he went around us. The others flew by us too fast to get a shot. Traveling with a dog in Italy is not a problem, but you do need to make sure your hotel allows them. I didn’t have a lot of time to find a hotel, so kind of hastily picked one from a pet-friendly website. Hotel Marco Polo is very near the old city. It was fine – very clean, AC (we forgot how wonderful that is! ), nice breakfast, free wifi – but the room we were in was very small. That’s OK with us – we don’t spend a lot of time in the room, especially on a one night trip. Verona is a beautiful town with a great Roman amphitheater and a Roman forum that has impressive frescoes that can still be seen along the top of some of the buildings. Once there were so many frescoes that Verona was dubbed “The Painted City”. It will now, however, be permanently intertwined with those fictional star-crossed lovers Romeo and Juliet. We wondered if it would be the sixth most visited town in Italy if not for that clever marketing ploy. 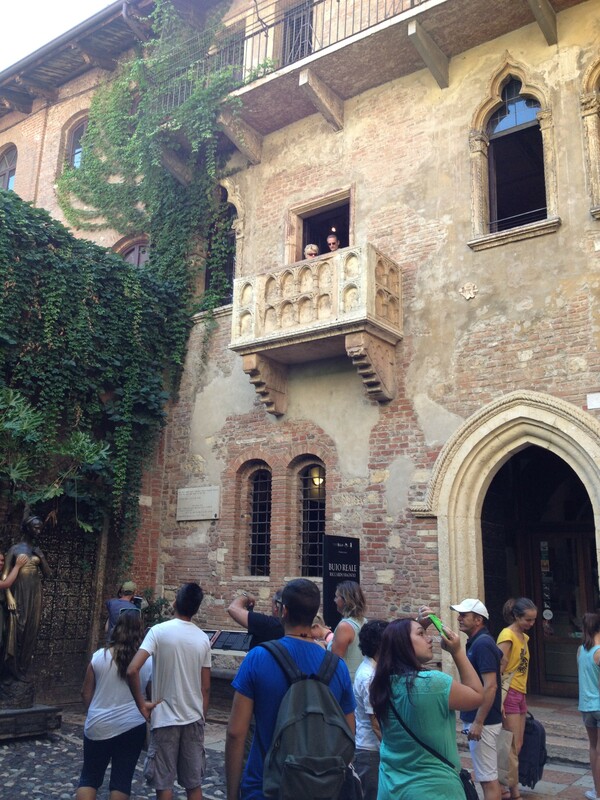 We even visited the famous balcony of Juliet ourselves. It is really quite lovely and very romantic and you can imagine the emotionally torn lovers exchanging their vows of everlasting love with Juliet poised demurely at the rail and Romeo boldly in the courtyard below. If Shakespeare had seen it, I’m sure he would have known instantly this was the one. But it’s just a pretty balcony in a pretty courtyard and it being Juliet’s balcony is as much fiction as the well-known story itself. But some very savvy Veronese sold it to the world a few decades ago and hence it lives as the balcony of Juliet. We all love a good love story, especially one so pure and tragic, so much that we want to believe that Juliet actually did stand at that balcony calling for Romeo. 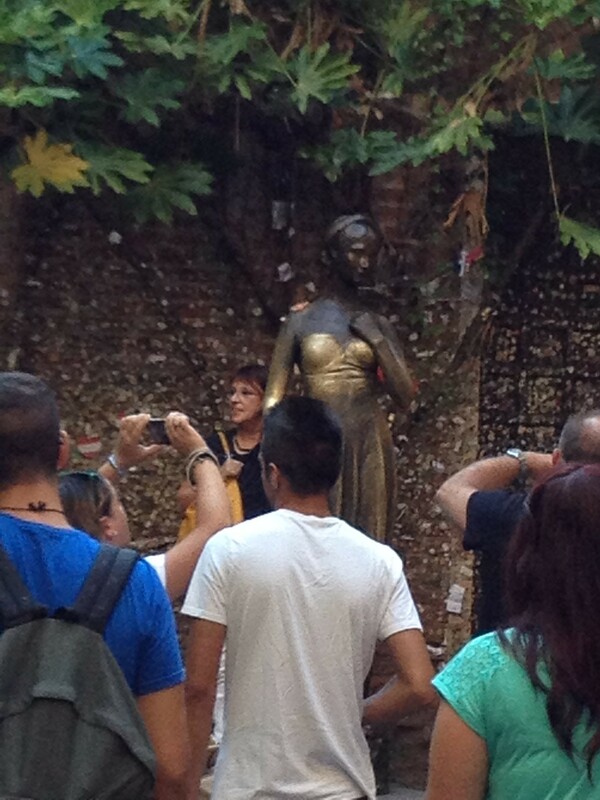 Now there’s a bronze statue of Juliet standing at the end of courtyard, her breasts polished and shiny from all the tourists from around the globe who rub them for luck in their own love lives. She who had no luck in her own love life has become a talisman for others seeking luck in theirs. After a wonderful stroll around town, we had a dinner at Cangrande, a great family run restaurant just off the Piazza Bra and a few blocks from our hotel. We both decided it was the best meal we had eaten so far. 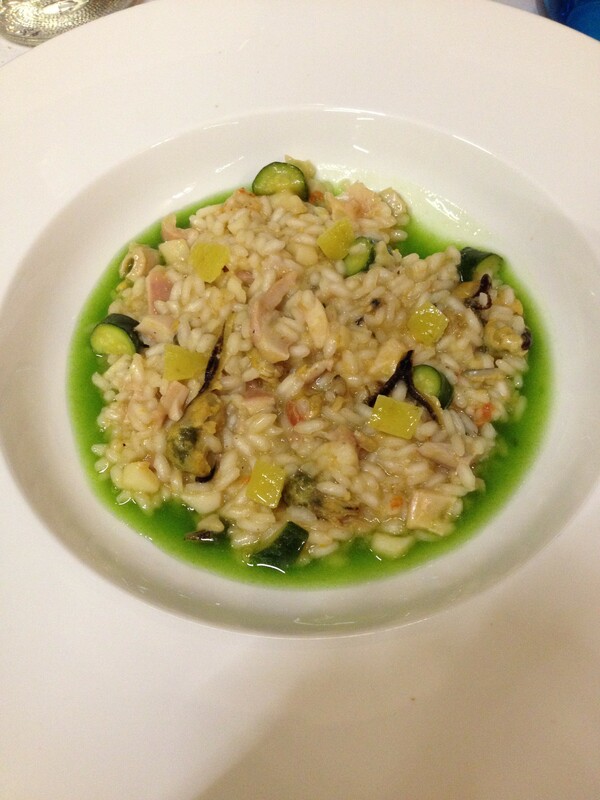 We shared the risotto with frutta di mare (shellfish). It had a basil water reduction in the base and a bright taste of lemon. My husband had the minestrone before and they felt sorry for me so they brought me a gorgeous plate of parmesan chunks drizzled with balsamic vinegar. The wine was a Valpolicella from the Veneto (the region we were in) and it was one of those bottles of wine that makes time stand still and good will emanate from all corners of the earth. 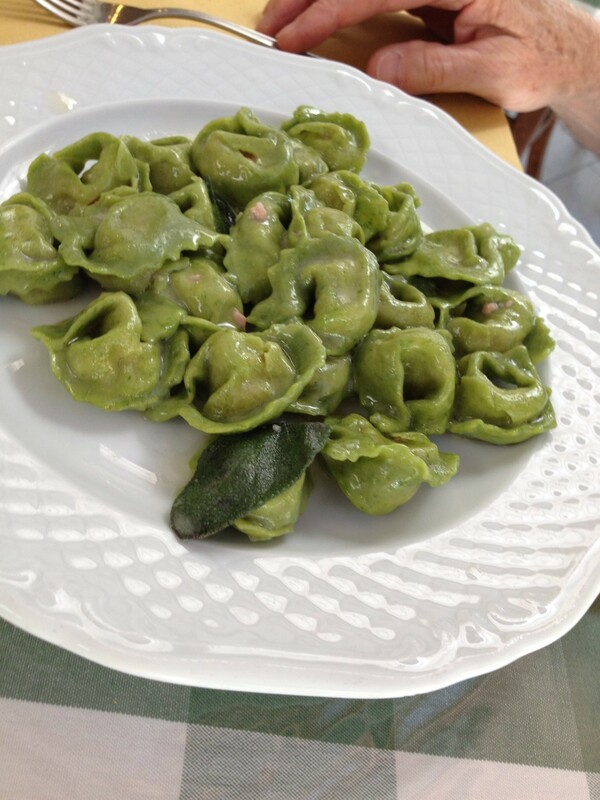 On the way back to Anghiari, we thought we would stop in Emilia Romagna, the next region down from the Veneto and known for its food, for lunch. 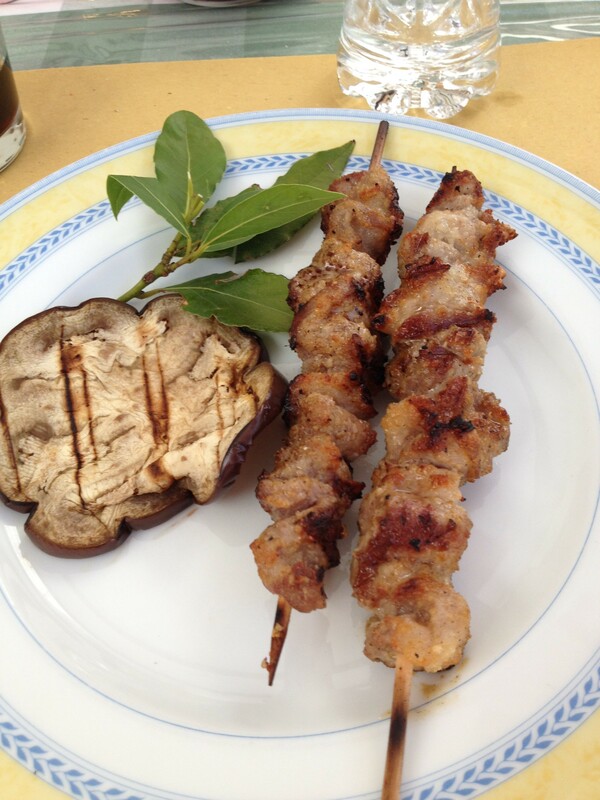 I quickly used my free wifi to search for slow food restaurants near Modena. I’ve used the slow food guide to restaurants in Italy for years and have never been steered wrong. I found one that looked pretty accessible and jotted down the name and address. 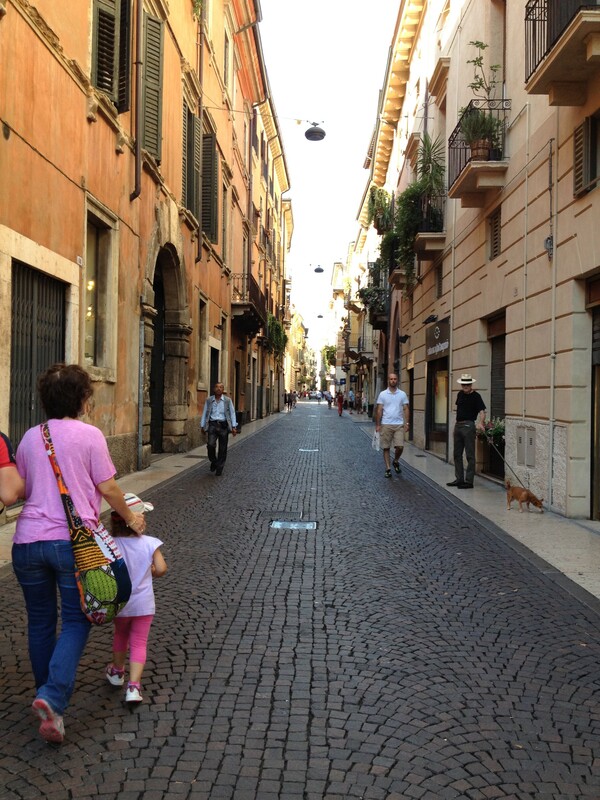 It was near a little town called Carpi, so we exited and asked the first people we saw for directions. Fortunately, they were policemen and even more fortunately, they spoke English. They gave us perfect directions, which we would NEVER have found on our own. We went right to it. Trattoria Cantone is in the little settlement of Cantone. It’s a clump of buildings right beside the road. It’s a place we would never have stopped in and the trattoria was a place we probably wouldn’t have thought about eating in. But we’re glad we did. They had a small menu and you could order anything from it or get a pasta, a meat, a side dish, water and wine for 15 euro. We decided to go all out and get the full meal deal and skip dinner. Great idea. I had a pasta called pettine with salsiccia and funghi (sausage and mushrooms). 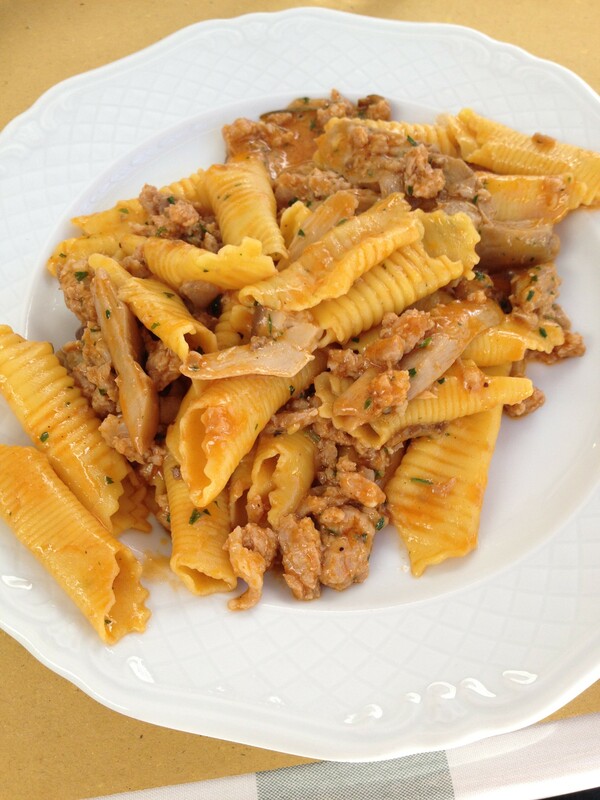 Pettine is a pasta specialty of Emilia Romagna. It’s an egg pasta rolled flat from a square of dough and then formed around a little tool into tubes. They’re then passed over another tool to make ridges in them. It’s similar to penne, but it’s bigger and has a seam where they’re put together. My husband had ravioli with emmental, butter and sage. I had little roasted lamb kabobs and a salad and my husband had what we would call roast beef with spinach. And our vino rosso. It was the house wine in a little half carafe, it was chilled and a little fizzy. Interesting, but good – very refreshing. It was a wonderful lunch. We savored every morsel and our little dog got to do one of her favorite things – take a nap in the sun. The drive back to Anghiari was much better than the drive to Verona. We got back to our little town and our little apartment and unpacked, relaxed and stretched out before our evening cocktails. It’s cool here in the evenings now and it’s delightful to be outside. We loved Verona and are glad we went, but we’re happy to be back in our little town. If you think this blog is heavy on food, you’re right. I won’t say it’s the most important thing, but it ranks right up there. We love to savor good food and we love to share meals with each other and with friends. That’s one reason we chose to take our sabbatical in Italy, where there are 5,789 kinds of pasta, 3,675 types of wine, and 2,598 varieties of cheese (these are only estimates). We plan to sample them all! Even the lamb looks good! I didn’t really know it was lamb until I started eating it! Good thing I’m a good omnivore!